Elisabeth Maria Linnemann was my paternal great-grandmother. She died 53 years ago this week (20 April 1966). I have been thinking about her a lot lately as I’ve been using her as an example of genealogy records in my Intro to Genealogy presentations. I am almost finished with an extensive biography of her, with records and images, but that’s a bit long for here. When we look into our family history, we often learn things about ancestors that we didn’t know, or that our parents and grandparents didn’t know. What often strikes me about Elizabeth is that she was the only biological grandparent that my father got to know (his other three grandparents shortly before his birth). He called her “Mem” and has shared stories about her, yet there are details about Elizabeth and her family that I have uncovered which my father never knew. Mem was the only daughter of Gerhard Linneman and Barbara Elizabeth Nilkowski. My Dad knew of her brothers that lived in Monessen – Gerhard, George and Christian (Christ) – and has faint memories of seeing “Uncle Christ”. He did not know that she had a brother, William, who moved to Chicago, and that Mem had two brothers who died in Germany, both named Rudolph. My Dad now understands why his Uncle Frank’s middle names was Rudolph. Mem’s father Gerhard was her mother Elizabeth’s second husband. Her first husband was Christan Fasel, who died a few months before their son Christian was born. Elizabeth married Gerhard within a year of his birth, and Christian was always known as Christian Linnemann. Uncle Christ was Elizabeth’s half-brother. Mem and her first husband Frank had a third child, Alma Mary, who lived for only one day in 1916. Agnes Elizabeth (his mother) was born in 1915, and Frank Rudolph was born in 1918. Mem’s father Gerhard committed suicide. This was a complete shock to my father, and he believes it was unknown to many in his family. I wrote about Gerhard’s death here. My dad grew up with Mem, remembered some of her brothers, but had never heard of the suicide. In fact, he didn’t even know that her father had ever been in the U.S. – Gerhard was never mentioned. Mem graduated from nursing school in 1926, when she was about 29 years old. A newspaper article mentioned that the class of six women had been in training for three years at the Memorial Hospital in the neighboring town of Charleroi, as well as studied at the Children’s Hospital in Pittsburgh. This is an especially notable unknown detail about Mem since her daughter Agnes (my father’s mother) also went to nursing school after they moved to New Jersey. It is unknown how long she worked as nurse, but must have stopped by the time my father was born and/or living with her in the 1940s. Mem’s first husband Frank had a moving and storage company in Monessen, which my Dad knew about. He did not know that the company ran into some troubles in the 1920s. A front-page newspaper article announced the settlement of a case against Frank and his company. A man was accidentally killed by a railroad rail that was dropped by an employee. The widow received $9000 in the settlement. Two years later, another article reported a man was critically injured after being crushed by a truck operated by Frank. By 1936, there was a notice of a final bankruptcy hearing for Frank. Even when we feel certain that we know about our family history, it is possible to uncover surprises or unknown details about our ancestors. While none of these were truly shocking family secrets (well, maybe the suicide), the others were unknown details that helps us to understand who Mem was, and how these details may have affected her as a mother and grandmother. Mem and Pap (her second husband) were my father’s grandparents – the ones he celebrated holidays with, lived with, and connected with as a boy and then as a young man. The details about her life – both known and previously unknown – are parts of her story. I am thankful for who she was and the family that she raised, including my grandmother and father. Have you uncovered any hidden details about ancestors – big or small – that were unknown to your family? © 2019 LAURA CUBBAGE-DRAPER. ALL RIGHTS RESERVED. Agnes (Speck) and Art Cubbage, New Providence, New Jersey, circa 1954. It’s Women’s History Month, and I am highlighting my female ancestors. My grandmother, Agnes Speck Cubbage, died when I was only six years old. These beautiful images of her, long before I was born, capture some of her personality. My grandfather, Art Cubbage, was the photographer of his family. He wasn’t in many of the pictures – he was usually the one behind the camera. Art took pictures of his family and friends on holidays and at family events, but also around the house and yard. I have already written about his awesome slide collection (which was dated and labeled!). The black-and-white earlier prints were just as wonderful, although these were not labeled like the slides. While Art’s posed pictures of family in front of the Christmas tree were nice, it was his candid shots of his wife Agnes that I love the most. I absolutely love this picture! These mundane, everyday shots of Agnes might seem unremarkable, yet I feel that I know her a little better through these images. Agnes’ expressions share so much about her. I like this one because it shows their kitchen in New Providence in the 1950s. I remember visiting in the 1970s, but some things had been updated by that time. I wonder what she was saying when Art took this one. This series of pictures isn’t labeled, but appear to be taken in their backyard in New Providence, probably in the 1950s. It looks like something happened after the first two shots and Agnes was going towards Art. This one really shows a more playful side … different from the posed pictures, and so many of the other candid shots of Agnes where she seems more serious. Many of Art’s pictures are of Agnes doing everyday activities … cooking, drinking coffee, reading the newspaper. I love these snapshots of their life together. This is one from the slide collection. It was double exposed with another image overlaying it towards the bottom. Even with that, I like her seriousness and expressive hands while she is talking. Again, I would love to know what she was talking about. This serious picture of Agnes was with a series of images of her and sons Corky and Jeff, where they appear to be on a boat trip. I love this picture too! Another picture of everyday life … talking on the phone. I can remember where the phone was in the hallway, as well as the one-piece table and chair by the phone (some call it a “gossip chair”). I like the glimpse of their bedroom in the background too. Even in this posed shot, I love Agnes’ expression and the way her sons, Corky and Jeff, are looking at her. A more serious, pensive picture of Agnes. The red lipstick is a contrast to the simple housecoat. I am so thankful for all of the pictures that my grandfather took, especially the ones of my grandmother. I wish I had seen them years ago so I could have asked him about them. Lesson learned … ask your family about pictures now so that we aren’t leaving it up to speculation years later! As you research your family, go through any photos that you can find. Ask your living relatives about the people. Look for those everyday images of your ancestors’ lives. Did you have an amateur photographer in your family? Do you have any favorite pictures of your ancestors? I love to play cards – poker, hearts, canasta … you name it. This is because I was raised by some serious card-playing Cubbages. Family favorites included hearts, poker and “aw $hit” (also known as “oh hell” or ”aw pshaw”). If there were Cubbages gathered together, there was always card game. I think of my grandfather – Art Cubbage, known to us as Pop-Pop – whenever we play. We even had an honorary game of “aw $hit” after Pop-Pop’s funeral. Story #1: Pop-Pop’s favorite card game was Hearts. And he was good. He played regularly with his friends Bob and Ralph. They would get together every year or so for a Hearts Tournament, where they would meet and play for the weekend. They had a flag with a heart on it, a medal for the weekend champion (who kept it until the next tournament), and some years even had matching shirts! It sounds like such a fun weekend away to me! Easter Sunday! This was when Pop-Pop was living in New Jersey and my grandmother and the boys were still in Pittsburgh. I wonder how he got away with that one! One of them would deal out the cards and mail them to the other two players (each person would get his 17-card hand, and I’m guessing that he held onto the “kitty” until the first hard). Then the person who was to the “left of the dealer” would mail his card that he “played” to the next player, who would add his card and mail both to the next. The dealer would mail the “trick” to the winner, who would then play a card to his “left” and so on. These games would last months. Those were some serious card players! In this day and age of instant gratification and immediate results, it’s hard to imagine a game going on for that long. But I can envision how excited they were when they received an envelope of cards in the mail! In the 1960s and 1970s, my grandfather hosted a poker game in his cellar twice a month with some friends from his neighborhood in New Providence. This picture is probably from the mid-1960s. My grandfather is in the middle … with all of the poker chips! The young fellow to the left is my father, who was probably sitting in for one of the guys. At some point in the mid-1970s, my Dad brought me and my sister along when he went to play one Friday night. And you can ask my sister … we still remember listening to their chatter in the cellar through the heating ducts from upstairs! Fast forward another 20 years and the weekend card playing returned! This time Pop-Pop played “aw $hit” (notice the matching sweatshirts for the occasion!) near the Poconos with his sons Jeff and Corky, and his friend Willie. Both of my sons are good card players, and we enjoy playing a few hands over school breaks or with the rest of the Cubbage clan. This family tradition will be passed down to another generation of Cubbage descendants! Happy Birthday and Happy New Year! 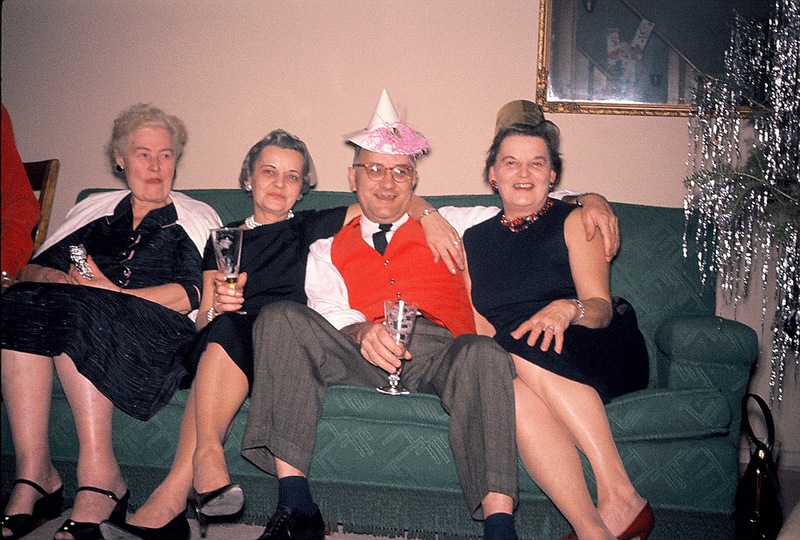 I love this picture of my grandfather, Art Cubbage, taken on New Year’s Eve 1959. This was probably taken at a neighbor’s house in New Providence, NJ. Art’s mother-in-law, Elizabeth Linneman Speck Merz is on the far left and I believe the other two women lived on the same street. My grandfather was born on December 31, 1912 in Swissvale, PA. Since his birthday was on New Year’s Eve, he always had a party! Wishing you all a Happy New Year! May you find exciting new discoveries as you climb your family tree! © 2018 LAURA CUBBAGE-DRAPER. ALL RIGHTS RESERVED. Fearless Females Friday – Girlfriends! I am fascinated by the stories of our women ancestors, and those Fearless Females in our family trees. We think of them as mothers, daughters, grandmothers, aunties … and also girlfriends. As November comes to an end, and after the last week’s day of Thanksgiving, I’ve been thinking of how grateful I am for my girlfriends. Through every season these women have shared insight, laughs, feedback and love. I wonder if my ancestor’s girlfriends were just as important to them? They had sisters, neighbors and friends. And it certainly “takes a village to raise a child.” In very different ways than it does for me. These women took care of their families, lost children and husbands to death and illness, had sons (and husbands) go off to war, moved across the state (or the world). I would imagine that they absolutely needed that network, and that women’s friendships were just as important to my ancestors as they are for me today. I have always wished for a journal or diary of one of my ancestors. One that might tell me about their lives. But alas, I do not. Still, I can guess a little about their girlfriends from these pictures. My 2nd great-grandmother Barbara Elizabeth Linneman. She looks so serious, but had been through a lot (I’ll post on her later); her friends had to have been important. She’s with “Mrs. Paul” a neighbor in Monessen in the 1920s. My grandmother, Agnes Speck mugging for the camera with girlfriends, circa 1937. My grandmother, Elise Gegenheimer Haberkern, having fun with a friend in 1961. Agnes Speck Cubbage with neighbors Irene and Virginia in New Providence, 1955. Elizabeth Linneman Speck, with her daughter Agnes and fiends. The back of the photo has “Neptune Cottage 1939” written on it. Treasure your girlfriends and the power of women’s friendships. There is something incredibly powerful about standing on the land that my second great-grandmother, Barbara Black Cubbage, bought for $232 in 1873. Oh, and she was 5 months pregnant with her 9th child. Copyright © 2018 LCD Genealogy Services.